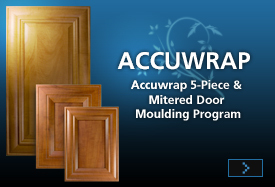 Founded in 1989, Accuwrap’s goal is to offer a full range of products and services for the RTA Furniture Industry. Accuwrap Profiled Components has developed over the years to be a premium supplier by offering our technical expertise in many markets such as Store Fixture, Kitchen and Bath, Architectural, Audio-Video, Picture Frame and Flooring Industries. Accuwrap uses sophisticated, state-of-the-art equipment to deliver customized, cost effective solutions to our customers. We focus on customer service and quality products. Accuwrap stands today as a leader in value-added programs, dedicated to delivering the various products your organization needs, on time and consistently exceeding your expectations.